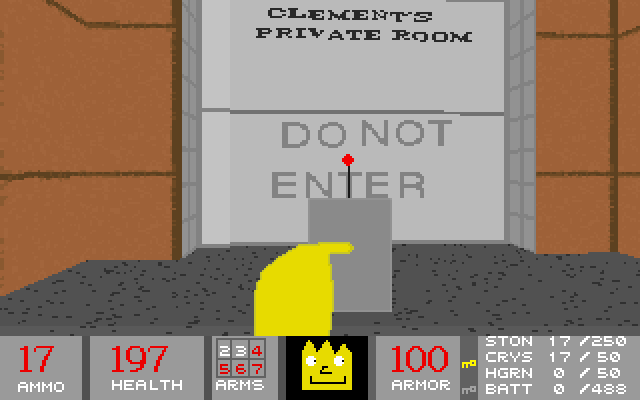 Today’s game is some-what unusual, it is a DOS game that was released relatively recently, at the end of 2013. It was mostly developed by one guy, Michael Muniko, which is quite impressive really given the scale of the game. It is an obviously Doom inspired FPS built using the Build engine. 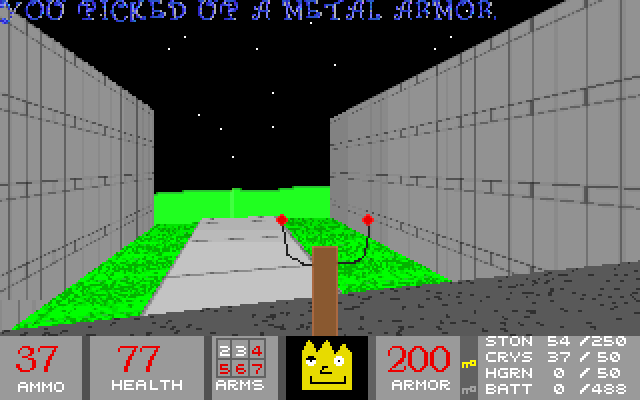 Unlike many others, who would produce a total conversion mod for something like Duke Nukem 3d, the developer has instead built their own DOS executable from source. This was certainly an ambitious project right from the get go. I played today using Dosbox, and there are a few things you’ll need if you want to play. Firstly, whilst the game only requires 8Mb of RAM, it doesn’t recognise it correctly under Dosbox. To get around this you need to set the amount of memory to 24Mb or higher, I have mine set to 32Mb. I have no idea if this is true of an actual machine as I haven’t tried it on one yet. You also need to set a reasonably high cycle count, I tested the game at 60,000 cycles. Lets start with the graphics. 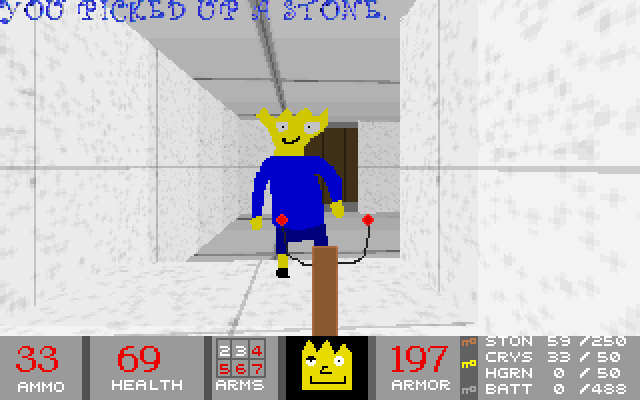 The game uses VGA graphics, which is no surprise as that is what most build engine games support. The art style of this game is what confuses me the most. It looks like it was drawn in 5 minutes per sprite with MS Paint to put it bluntly, but it kinda has a weird childish charm as well. I could imagine having drawn something like it when playing with paint as a kid. I’m not really sure what to make of it, either he was a bit lazy, or deliberately chose this style for artistic reasons which would be clever. After all the game is set with-in Shaw’s dream world. Unfortunately some of the sprites will cause problems. Their size will sometimes cause them to clip into walls, which fortunately doesn’t happen often. The biggest problem is with the corpses being just as large, blocking your view, and looking not much different to the live creatures. 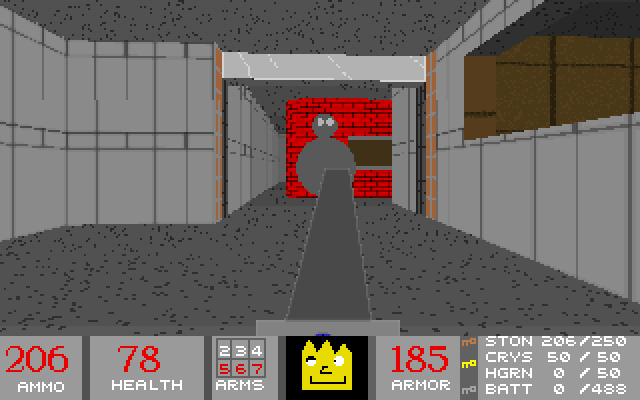 Doom sometimes suffered a little from this when you encountered any number of certain enemies, but you could usually see over them to some degree, and they were obviously dead. The sound design, like the graphics, is either lazy or very clever. The music sounds like random mashings on a keyboard, as if he threw a random number generator at the music. I can’t say it’s bad, it doesn’t hurt your ears, it’s just somewhat surreal. Sound effects for Shaw himself are much better, albeit a bit quiet, they sound like they are the straight recorded voice of an actor/friend. The creatures however sound somewhat deranged, for some reason he used cats yowling for many of the effects and other strange noises. Weapon noises are fairly run of the mill, but are too quiet to make much impact. 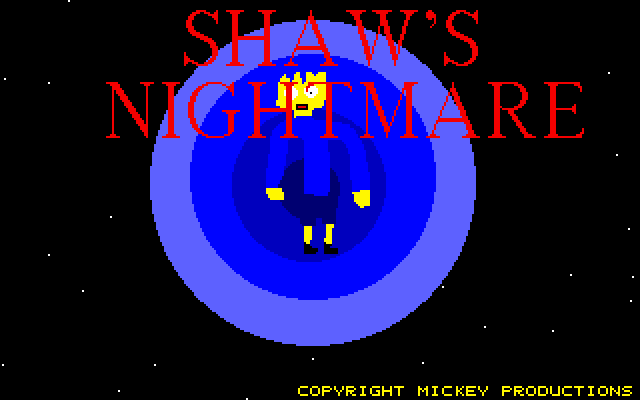 Game play wise, Shaw’s Nightmare is very much like Doom. The weapons, whilst sounding and looking a bit different are largely the same as the weapons in Doom. 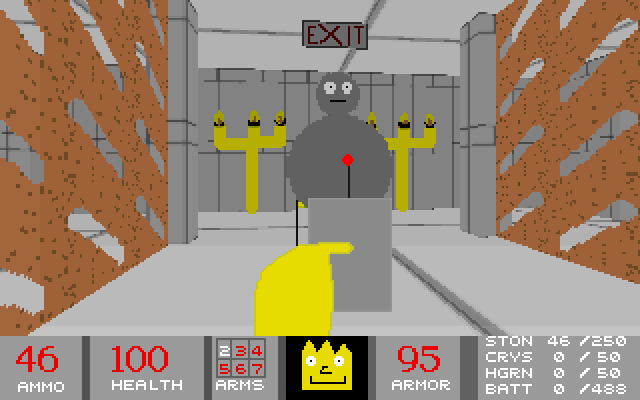 The creatures encountered in the first episode are much like the basic enemies found in shareware Doom. Although they are much more brain dead than even the zombies. The level design is different, however I’m not sure how to describe it. They are elaborate in a way, but also simple in their design, not a bad thing by any stretch. There is some variety, some levels are more open and set outside, whilst others are closed and set in corridors and maze-like structures. Because the same simple textures are used repeatedly you may get lost, but I didn’t experience as much of this as I thought I would. The controls are probably the part of the game which annoyed me the most. I used the keyboard as that’s what I would normally use for a vintage FPS such as Doom or Duke Nukem 3d. I found it to be kind of like walking in treacle in the sense that it takes a while before you accelerate to normal speed, in turning as well as walking. Then when you release the key it takes much longer than you’d expect stop. This makes it really hard to aim and move with much precision. I would have had much more fun if this was set up more like Doom or other FPS games. I don’t really know how to summarise Shaw’s Nightmare. It’s certainly feels surreal and strange, much like the dream world it is set in. But on the other hand the graphics and sound clearly could be much better. Neither are obstacles to it being fun, the controls are pretty much the main reason I found it frustrating sometimes. Should you play this? If you’re curious about an obscure FPS made by an individual, then yes. If you want to play something polished like Doom, then you should probably play that instead. Update: The author has provided a link in the comments to a new version that controls better. It’s still not perfect but makes the game much more fun and easier to control. I was benchmarking a win98 machine when I read this so I tried the game on real hardware (though not “true” DOS). it seems to run fine on my AMD 1.43ghz Athlon XP machine under Windows 98SE, 512MB SDRAM, Matrox G400 MAX and SB Live! I ran it through Windows and it seemed to run just fine. the SB emulation worked fine as well. Cool, were the controls any different? What did you think of it? I didn’t have time to try it out on real hardware, but I might have a go later today. I didn’t put to much time into it but they controls were as you described, not great. seemed like there was a small delay with the shots as well. You hit the nail on the head though with saying it looked done in MS Paint because that was my first impression. I get it though. sometimes you can program but cant draw a straight line to save your life and cant get any artistically inclined friends to take time to help you. he may of just been a decent programer and a horrible artist so just did the best he could. honestly I probably couldn’t draw much better. I know what you mean, my own efforts often suffer the same badly drawn fate. In this case the graphics aren’t really the part that put me off the most, it was the controls that really got to me, especially when you’ve played most of an episode, it tires you out. I could have forgiven the graphics and sound, but the controls really do need work. Hello I’m the designer of this game. 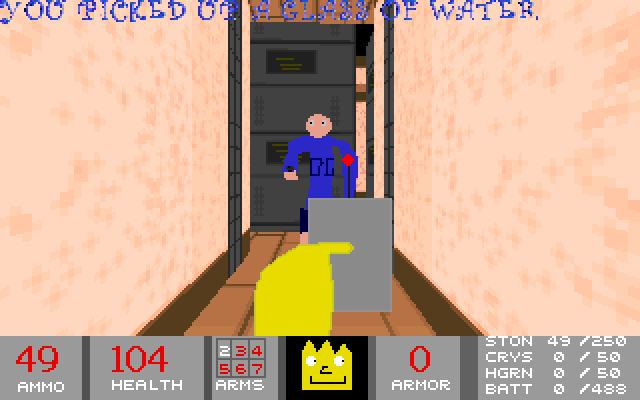 The game suffered many development problems from the beginning. The reason why the art is the way it is because I could not find any artist. Eduardo Sanchez Barrios came along but he left a few weeks after he joined. I could not find anyone else. 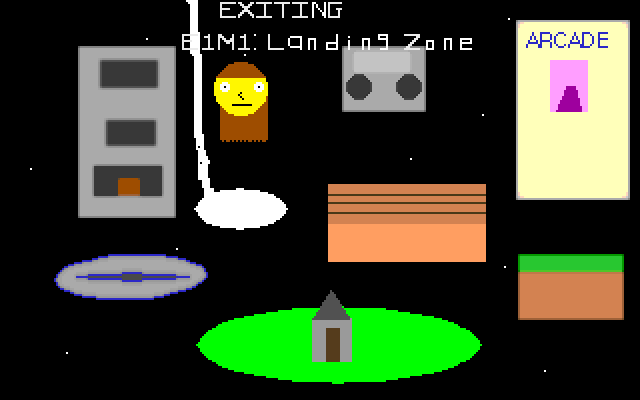 That explains how it ended up that way, I understand as artwork I produce for my own game isn’t high quality. It’s a common problem for programmers/designers. It’s also something quite difficult to get right. With practise and time and effort I’m sure you’d be able to make something better, but, like I said before I found the way the controls work was probably a bigger hurdle in terms of fun. About the controls… It seems you are using an older version of Shaw’s Nightmare. The later versions have toned down the time it takes to stop moving. I downloaded version 1.6 is there a newer one? I had a quick go with this version and it’s certainly better, not perfect but heaps better.